If I were to ask myself a few years back “Do I need a maid?”, I'd have told myself that I was a complete idiot even asking a question like that. After all, I'm in another country- a rather expensive one at that. And the extra cost of having a maid is totally unjustified at any point of time....or is it? And what about my incessant need for independence? What was to become of that? 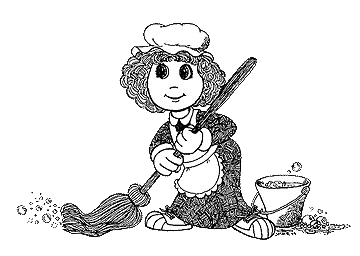 I DEFINITELY DID NOT NEED A MAID – now or ever! I was self reliant! I was independent! I was monetarily wary! And despite all the piling housework, I was happy-happy doing it my way. Mr Sinatra would have been proud of me! But somehow, to my utter dismay, times seem to have changed rather quickly and so had circumstances. Time and tide and all that. A month ago I started introspecting and questioning the very fundamentals of my existence. That's when the “maid” issue started ringing in my head like an unwanted yet necessary gong. Was it true that I couldn't cope anymore? Was it true that the long arduous hours going into business journalism were sapping my emotional and mental strength? Was it true that my household chores were being seriously neglected while I turned a blind eye to the ghastly reality of things? The time had come to face the truth. I was a busy woman and yes, sometimes way too busy to attend to things at home at the appropriate times. I had barely enough time to cook two square nutritious meals a day – leave alone the mopping and washing among other things. Sadly, I agreed to the fact that I needed help. Grudgingly I agreed to get someone else on board the Shreyasi ship. You see, I am painfully aware of dust or dirt in any form. I am super sensitive to uncleanliness of any kind and a disorganized home is something that sends shivers down my spine-the kind people get when they watch 'Poltergueist' at 1 am. In fact, when I go on one of my whirlwind cleaning sprees (which sometimes last a day at a time), the husband and the dog slowly steer clear and stay away till I'm done...which is why the prospect of getting someone else to “clean” was enough to make hubby wash his hands off the whole affair while the dog was content growling in disapproval. Anyway, I still maintained that a full time maid would be way too expensive for us at this juncture. Although it is common practice for most families (expat and local) here to have maids living with them, I was never very comfortable with the idea. I am a fairly private person, I value my space and am content to work harder than others and having my space to myself. Also at this juncture, we don't have separate quarters for a live-in maid, so I decided to settle on the next best thing. I decided to look out for part time help-something extremely rare on the island. I looked everywhere and turned to every possible source for a part time maid, but to no avail. Just when I was beginning to take it as a sign from the Lord above, for me to “get my act together and take care of my own home”, my neighbour called and suggested her own part time helper. And I thought I knew God's will. Go figure. Her name was Tilu-the maid's, not my neighbour's and she was vouched for in every possible way that one can be vouched for. She was allegedly punctual, her habits unquestionably clean, her social life indubitable, her work was apparently par excellence and her rates were far lower than average standards here. There was God's sign if I ever knew one. I called Tilu that very day and she agreed to work for me Saturdays for a minimum of three hours. I couldn't ask for more. She was hired. I was decidedly anxious the first time she came into work. I'm kind of territorial about my home and also I have been particularly proud of my cleansing conquests. I mollified myself with the fact that I would now have more time on the weekends to do what I love most – cook, spend time with the family and write. But I still kept wondering if it would work or was it all just a very bad idea from the start. The whole thing was obviously a family affair. Calls from in laws and parents in Mumbai and grand parents in Kolkata started pouring in from the fated Saturday morning. Maid advice was hurtled at me like large boulders and there was a premonition of dread across the miles connecting the three cities-all unfounded of course. A smiling Tilu turned up at exactly 1:30 pm-the time we had decided on. “That's a good start,” I told myself. I am super-punctual myself and therefore highly regard others who are too. Tilu doesn't believe in wasting time with dilly dallying or small talk. She came in, changed into her work clothes and immediately got down to business. I began ordering her around-telling her what to do, where to source cleaning material from, how to organize things and where to stack stuff, but it wasn't long before I realized that the only thing benefitting from the charade was my own ego. She didn't need me (although she was nice enough not to say it to my face). She was a one-woman machine. And I watched open mouthed as I saw the house being transformed bit by bit as the minutes rolled by. As I stood there like some weird, baited and stranded angler fish, Tilu washed the piled up dishes, scrubbed the kitchen counters, cleaned the stained shelves (inside and out), arranged the vessels, dusted the piano and the furniture in all the rooms, swept the floor, mopped the floor, cleaned the big french glass windows, scrubbed the verandah and hosed it down thoroughly, ironed the clothes for the week and finally finished off with the bathroom. By 4:30 pm, my bathroom was sparkling, the bedroom was tidied, the altar was cleaned and organized, clothes were ironed, the living room was glittering and the verandah was suitable for a sleepover! And all this before the customary 5'o clock chai! I was stumped. I was happy. But at the same time, I stood there forlorn – a poor, defeated, wreck of a woman. I-who had prided myself on my top notch household maintenance-was suddenly second best. Tilu stood victorious. Although-she laughed through it all, took her pay (which was more than due to her) and promised to return the next week. It was all seemingly mundane to her. And to me it was a miracle in disguise. Tilu was a maestro and I accepted it honourably. In fact, such was my acceptance of the famed defeat that I allowed myself to actually look forward to her coming the next week. By the time Friday evening had arrived, I was already looking to see her welcome face at 1:30 the next day. And sure enough, she was there-big smile on her weary face-all ready to get into action. And I let her. This time I promised myself to let her do her thing and not get in her way. I shut up and sat with my regular newspaper cuttings, while she went around from one chore to the next. I had just finished my week's worth of papers, when I saw her dressed and ready to leave. Her job was done-and well done at that. Last week, I finally realized just how dependant I had become on this tiny little Nepali woman who had left behind a husband and three children in Kathmandu to smilingly do the very work which I had come to think of as too mundane to waste my time with. I woke up on Saturday to a pile of dirty dishes and a house that had been systematically disorganized through the week by two people and a dog who did not have the energy to care. And something inside of me shrieked “OH MY GOD IS TILU COMING TODAY?”-the anxiety levels were distinct since I didnt know where to begin cleaning and where to end. At 1:00 pm I made the frantic call. “Tilu will you be coming today?” and pat came the reply which had the combined effect of three sedatives taken simultaneously, “Yes Ma'am reaching in half an hour.” Crisp yet effective. I heaved a sigh of relief and that's when it hit me-my utter and total dependance on this girl who till a month ago had been only a face I saw occasionally. But now circumstances have changed. Tilu has become a part of my Saturday life and a very important one at that. Not only because I depend on her to clean and organize my home and prepare it for the turmoil of the coming week, but also because her presence reminds me of so many things we take for granted in life-the wondrousness of being with loved ones and the pain of being away from them, learning to live and survive in seemingly impossible situations, smiling through this kind of survival, being chirpy and curious about everything that life has to offer, loving life the way it is instead of asking for more and most importantly, working hard and being proud of it. Its Friday night as I write this and tomorrow Tilu will grace my home again. We often speak about Laxmi in the form of the wives and daughters of our homes. But rarely do we acknowledge the presence of Laxmi in the average household help who keeps Laxmi where she belongs-within our homes and our hearts-when we ourselves become too busy to do so. I am a self reliant, independant ex patriot. And I say it now- Thank God for My Maid!